Today is my dad’s birthday. I wish he could be here to celebrate it. The scarf in this picture is a blend of tans and browns. I can remember my dad wearing it, exactly the way he’s wearing it in this picture. 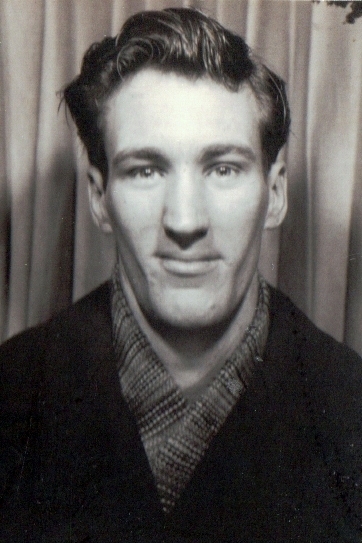 Except he appears to be in his late teens in this image taken in a photo booth. He must have had the scarf throughout his Army enlistment, marriage, and the birth of several children. The only other garment that stayed with my dad that long was his Army jacket, and that was packed away in a trunk in the basement. He had to have been wearing this scarf for almost 20 years by the time I was old enough to take notice of it. And he wore it long after that. Was the scarf around for so long because it had sentimental value? Did someone special make it for him? Who would that have been? An old scarf. A momentary diversion from missing you terribly. Happy birthday Daddy.